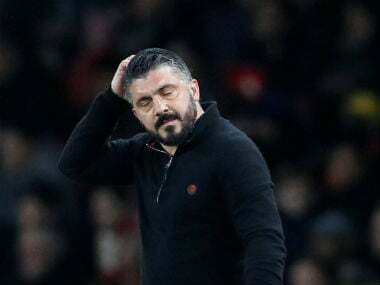 Milan: AC Milan coach Gennaro Gattuso said his team had nobody to blame but themselves after they lost 3-1 at Olympiakos Piraeus and were knocked out of the Europa League in the group stage. “We gifted the game to Olympiakos,” he said after Thursday night’s defeat in Athens, where all the goals came in the second half. Gattuso said the seven-times European champions simply went to pieces after missing their chances. “We had the game in our hands but if you create seven or eight chances in a stadium like this and then fall apart the moment things go wrong, you deserve to go out,” he said. He refused to blame the hostile atmosphere, or refereeing decisions which went against his team. 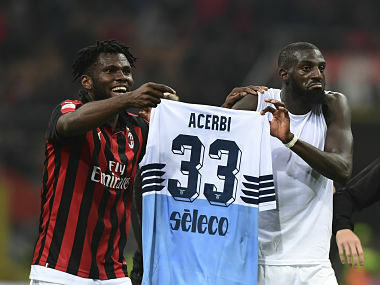 “You can talk about the referee, about them throwing extra balls on to the pitch and the strange trumpet noise, but we should focus on what we can do to make Milan a better team,” he said. “We have to look at ourselves. They were better than us because they were energetic and determined. I apologise to all the Milan fans around the world for not having achieved our objective”.